With regular watering of home lawns throughout much of the growing season, many turfgrass diseases, once problems only on golf courses and recreational turf areas, now appear commonly. Perhaps the most important of these is dollar spot. On golf course greens cut at or below 5mm, this disease appears as white or tan spots of dead turf about the size of a silver dollar. Hence the name dollar spot. On home lawns cut at 25-75mm, dead areas may reach 50-100mm in diameter. These spots may run together, producing large areas of dead turf. Affected leaves initially show yellow-green blotches, which progress to a light straw color with a reddish-brown margin. Occasionally, white mycelium can be seen covering affected leaves in early morning on dew-covered grass. Dollar spot symptoms occur anytime from early to late summer. The disease usually reaches peak activity when air temperatures are in the 27° C range and under high humidity. Symptoms also may appear in the fall. 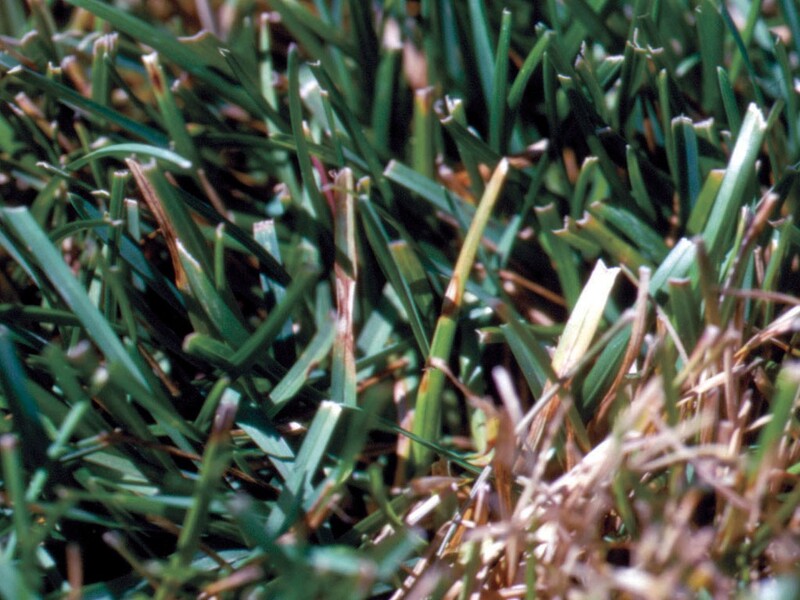 The most severe cases of dollar spot occur on turf receiving closely-spaced summer irrigation. The disease may also occur on nonirrigated turf when humidity is high from prolonged muggy summer weather. Dollar spot is more severe under nitrogen deficiency or when grass grows slowly. The causal fungus spreads via mycelium on infected plant parts (mostly clippings). Mycelium may be carried by the wind, water, or on turf equipment and shoes. This fungus does not produce spores. Sclerotinia homoeocarpa is thought to survive as thick-walled crusts of mycelium called pseudosclerotia in dormant infected plant tissues. Late spring nitrogen-fertilizer applications can help to minimize dollar spot severity, since growth will be stimulated during the period (early summer) when dollar spot infection begins. On lawns, fertilizer that releases nitrogen slowly over an extended period is more advantageous than a quick-release product at this time of year. On golf courses, quick-release nitrogen fertilizers can be applied frequently at very light rates instead of using a slow-release fertilizer. Irrigate deeply, infrequently, and early in the morning to minimize moisture accumulation on leaves. Also, remove dew by early morning mowing or by dragging the turf with a water hose. On irrigated turf with persistent dollar spot problems, fungicides are very effective against most forms of the causal fungus. 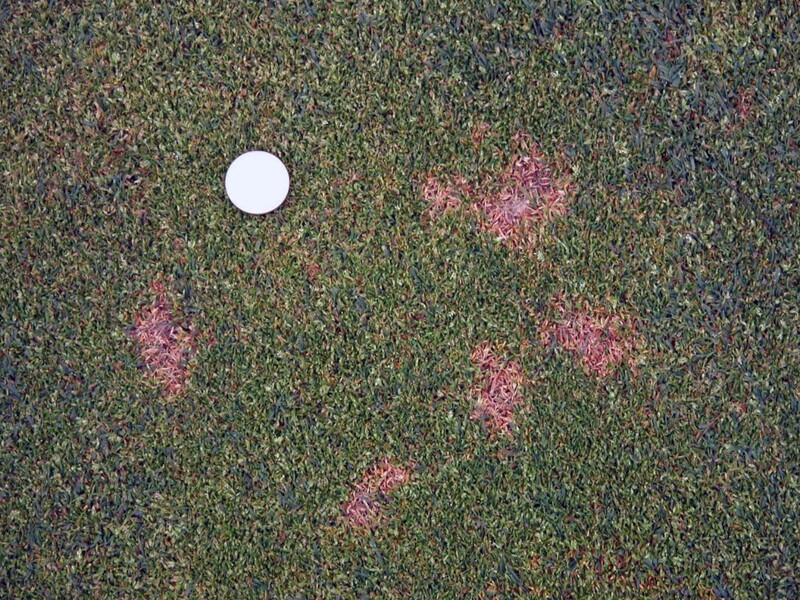 Fungicides are almost always applied on a curative basis for controlling dollar spot. Both contact and systemic fungicides are effective in controlling this disease. Because resistance to certain systemic fungicides has occurred with Sclerotinia homoeocarpa, using contact fungicides in a control program is suggested.